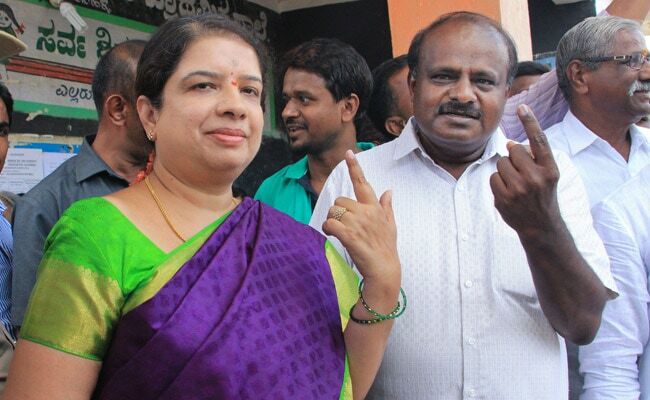 Anitha Kumaraswamy on Tuesday registered a record victory in Ramanagara assembly segment after defeating BJP candidate L Chandrashekar with a margin of 1.09 lakh votes. He had pulled out of the contest and returned to Congress, but still technically remained BJP candidate. "This is a rare occasion when a chief minister will be entering Vidhana Soudha (seat of state legislature) with his wife. Never ever have a chief minister and his wife become MLAs together," JD(S) lawmaker K Gopalaiah said. "While Kumaraswamy was Ramanagara MLA, Anitha represented Madhugiri assembly segment," Mr Gopalaiah said.